Notes: Developed by the late Larry Graham of Kirkland, WA in 1992, a noted fly tier and fly fishing guide. Originally, it was developed for the Yakima River but quickly became popular throughout most of the Western streams. 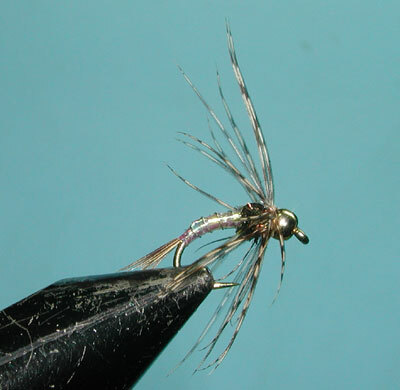 Brass beads became available for fly tying during the late 1980's and Larry saw the advantage of designing a nymph utilizing this beadhead for quick descents. He desired some flash and used flashabou as a ribbing but found that it just was not durable. Larry resolved this problem by using flashabou for the abdomen and ribbing it with copper wire. As the design progressed, Larry used Pearlescent Mylar for the abdomen since it had a greater durability and came in different widths. The material also gave a subtle green coloration to the abdomen from the refraction of the brass colored hook. A peacock thorax blended nicely with the greenish abdomen and legs were added using hen saddle hackle fibers. The pattern was first published through Fly Tier magazine in Spring 1998 and a subsequent book by Leeson and Schollmeyer, "Trout Flies of the West" (1998). It is particularly good on tailwaters. There are many variations of the Lightning Bug. John Mundinger came up with a nice variation enhancing the greenish color of the abdomen by using a chartreuse thread underbody with Chartreuse Ultra wire as rib over the Pearlescent Mylar. 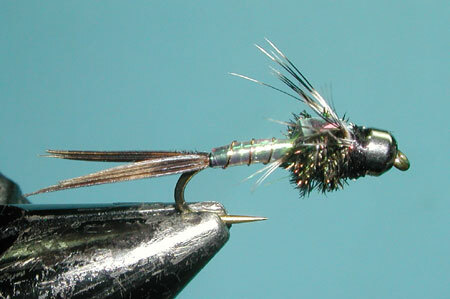 You may also find the use of Silver Mylar for the abdomen and the use of Hungarian Partridge as a soft hackle pattern. Different colors of Holographic Tinsel are also available and color variations are made with these substitutions. 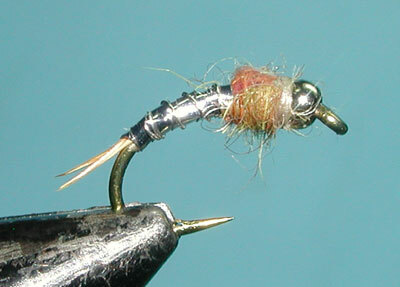 The thorax and legs are sometimes substituted with a synthetic dubbing which speeds up the tying process. Another touch to consider is a drop of epoxy on the wingcase as well as a thin application of epoxy on the abdomen without a wire ribbing. 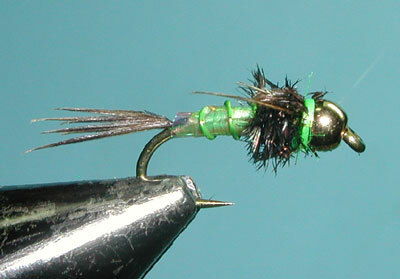 Larger sizes of the Lightning Bug #8-12 are also used for Steelhead in Northern Calif. and the Northwest Rivers.